is by Dante Gabriel Rossetti. Modern descriptions of these fabled creatures contribute to the general confusion. Most depictions, including various images in Naples showing Parthenope (the siren for whom the ancient city—before Naples—in this area was named), show them to be mermaids. Actually, ancient descriptions describe them as having bodies of a bird and beautiful human heads. There is, however, a more relevant episode, one that “explains” the existence of the three islands along the coast, today called Li Galli islands, but originally called Sirenuse—land of the sirens. Jason and the Argonauts, too, sailed along this coast and were tempted by the sirens. The Argonauts, however, were accompanied by Orpheus, the greatest musician in Greek mythology (Take that, fans of Hermes and Amphyon!). 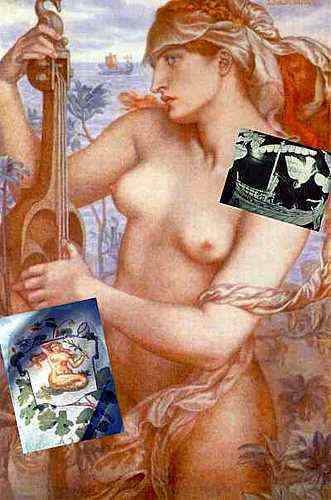 Orpheus outplayed and outsang the sirens and dispelled their powers, at which point they either (1) were transformed into the three small islands on the coast, or (2) threw themselves into the sea, washing up on nearby shores: Parthenope at the isle of Megaride in Naples, where the Egg Castle now stands, thus giving her name to the original city; Leucosia, farther south (Punta Licosa is the tip of the southern end of the Gulf of Salerno); and the siren Ligeia still farther south along the Calabrian coast near what is, today, Lamezia Terme. Less mythologically, the archipelago consists of three small islands, 1.5 miles off the coast, 3.5 miles southwest of the town of Positano. Today, all three of the islands—Gallo Lungo, La Castelluccia, and La Rotonda—are part of a protected marine national preserve. There is also a fourth small island, Isca, much closer to the shore, as well as another prominent, smaller rock sticking up out of the water between Li Galli and Isca, called Vetara. Both Gallo Lungo and Isca have structures on them and this has caused some modern confusion, as well, as to who owned what, when. There are some Roman fragments on Gallo Lungo, but the first modern construction on the island consists of a large villa and secondary building, built in the 1930s by the Russian choreographer and dancer Leonid Massine (1896-1979). That property later passed to another Russian dancer Rudolf Nuryev (1938-1993), who apparently wanted to set up a dance academy on the premises, an idea that did not come to fruition. Isca has a lovely villa and garden on the side facing the cliff (and, thus, not visible if you sail behind the island, as most do). It was the property at one time of the great Neapolitan playwright, Eduardo De Filippo (1900-1984) and is described in a delightful volume entitled, In mezzo al mare un'isola c'è... (There is an island in the sea…) by the playwright’s wife, Isabella, (2002, pub. La Conchiglia, Ischia). I am informed that Li Galli are owned at the moment by Mr. Giovanni Russo of Sorrento, who acquired the property upon the death of Nuryev and started a project of restoration. Now, on the main island, there is a restored castle and two villas. 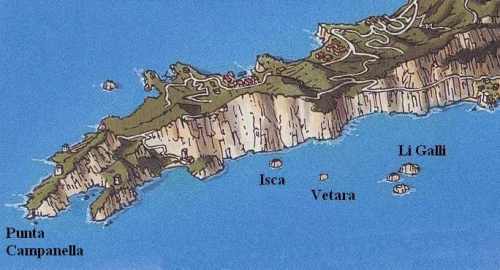 The smaller isle of Isca is the property of Luca De Filippo, son of Eduardo. In any event, the coast from Punta della Campanella all the way past siren country and on to the modern city of Salerno is of great beauty. Places such as Positano and Amalfi dot the shore below high cliffs along which, alas, far too many post-siren seekers after paradise have decided to build too many houses.